I’m holding a $15,000 book in my hands. It’s a one-of-a-kind piece of 1870s French fiction extolling the pastoral life. Its owner half-jokingly introduces it as the very first treehugger novel. I asked if I could open it, hopeful because it wasn’t under lock and key or behind glass, but surprised all the same when the request is accepted – if it was mine, I’d demand latex gloves. The touch, the smell, the hand-drawn pictures and binding all speak of a craft inimitable by electronics. Next to it is a self-published sliver of a book by a young and completely unknown Margaret Atwood. Further down along the tables are musty bibles from the 1700s; religious and political tracts hailing from the Glorious Revolution; limited edition lithographs from famed artists; old maps showing how far Montreal has evolved, yet how little it’s changed. 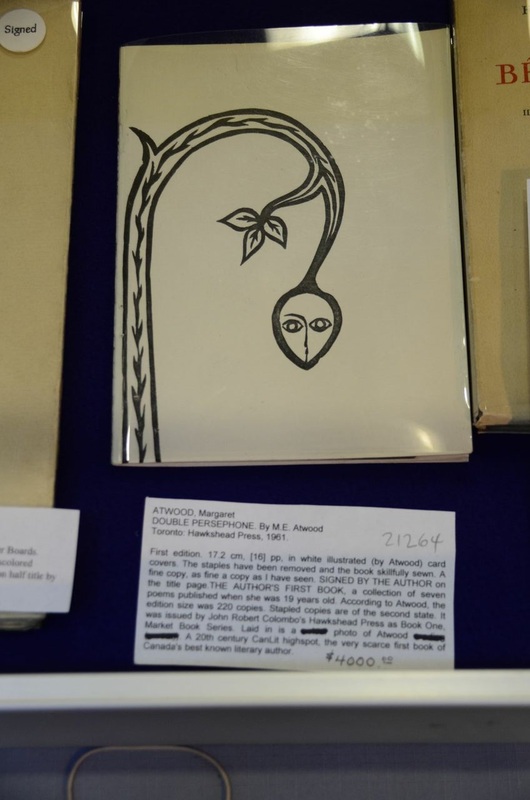 Though not a typical experience, this is what you would find if you attended last weekend’s 31st annual Antiquarian Book Fair, held at the ground floor of the McConnell Library building. The books (and maps) were wide-ranging and multinational in character, and their keepers a colourful bunch. The older books were kept quite in the open, which was unusual. Some were falling apart, but perhaps that was the reason for their display – you keep your real valuables safe and keep a few shiny ones for display. After all, students won’t routinely spend a few hundred dollars on a hard cover. More interesting and rewarding than the literature on display was the chance to speak to their owners and gain insight into a specialized industry. A relatively modest event of some two dozen participants ranging from as far as Ottawa and Toronto, they were nonetheless friendly and informative. Any bibliophile would find pleasure in discussing literature with them. After a few tables, one gains the barest of footholds in their world. Patterns emerge and similarities became apparent. Cartographers are a political bunch, dealing in visual representations of dominions and empires; the book antiquarians are a patient folk – more than once, I was told it took several decades of diligent service before clients offered their loyalty and the chance at seeing or handling the real treasures. All are ultimately salesmen, eager to cultivate connections but not necessarily open to discussing the tricks of their trade or the specifics of margins and sources. Judging from the median age of the book sellers, it’s not a business easily broken into. “You need about $2 million in stock to get $200,000 in [yearly] income,” said Wesley Begg of Toronto’s Contract Editions, which specializes in rare books. Despite prohibitive entry costs – or perhaps because of, as those able to sink such resources have substantial sums to fall back upon – Begg thinks the future of the rare and unusual book trade will always exist to cater to a wide array of budgets, from rich patrons to bibliophile student collectors. Not so for regular used book stores, which Begg declares a moribund industry. More nuanced is the opinion on the book industry as a whole: some see highs, others continue to experience tough times. Montreal isn’t Europe or New York when it comes to antique books. We’re not a major stopping point, and the offerings (and prices, which can hit millions of dollars) reflect this, but it’s nice to know Concordia’s library serves and will continue to serve as a gathering place for dusty tomes and their fans.